The West Windsor Bicycle and Pedestrian Alliance is dedicated to creating more safe walking and biking routes to our schools. When many of us were growing up, we walked or rode our bicycles to school. Walking or biking to school gives children extra exercise as well as a sense of responsibility and independence. Being driven to school increases traffic around schools; and busing children who live close to school, but lack the sidewalks and safe crossings to walk, costs all of us in taxes. A small way to begin is by starting a neighborhood Walking School Bus that runs perhaps once a week (with buses serving as a backup when the weather is inclement). It needs as little as one adult to get it started. Go to the Walking School Bus site. For those who prefer to cycle, start a bicycle train. The WWBPA is ready to help. Take part in International Walk to School Day, held every October. The WWBPA has marked this for several years with Walk to Hawk and would like to expand this program to other schools. Talk to your child’s principal about joining! E-mail the WWBPA as well. 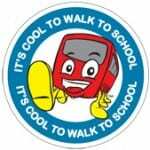 For more information, go to the International Walk to School site. Don’t forget to e-mail the WWBPA with ideas about how your child’s route to school could be made safer, whether in West Windsor or Plainsboro. Tell your school board members and government officials, too. Together, we can make it happen. Nate Byerley’s video about his daughter’s commute to preschool.